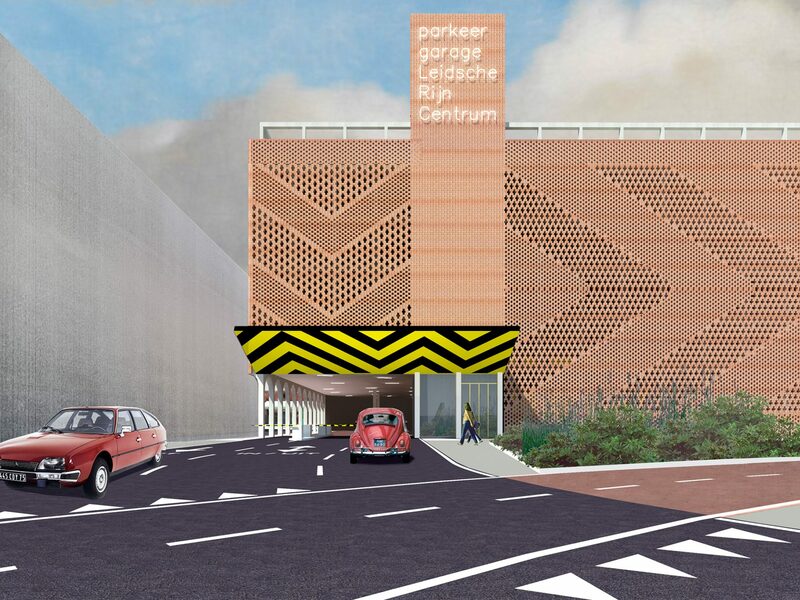 The assignment called for a public building that transcends its function as a parking garage and whose representation fits its strategic position in the classically designed centre of Leidsche Rijn. The masterplan for Leidsche Rijn Centre by Jo Coenen consists of robust, omni-directional building blocks which define traditional urban spaces such as streets and squares. 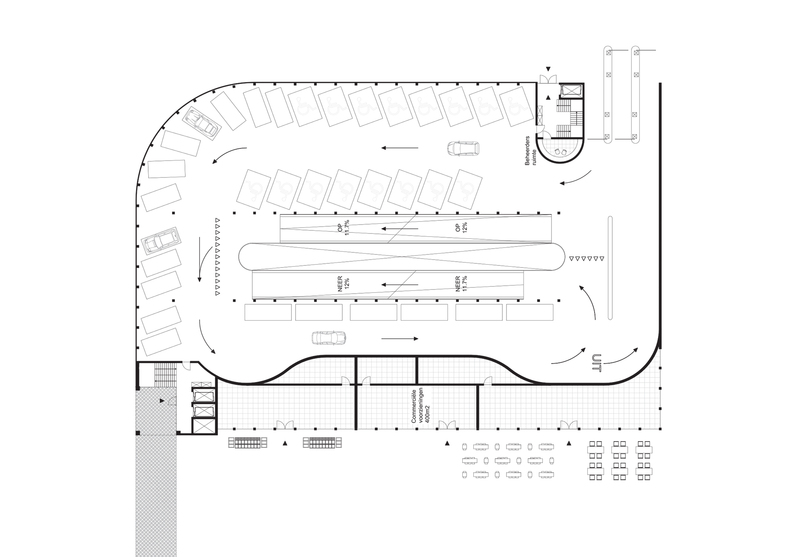 The prescribed architecture makes use of classic principles and materials, generating a consistent city tissue. 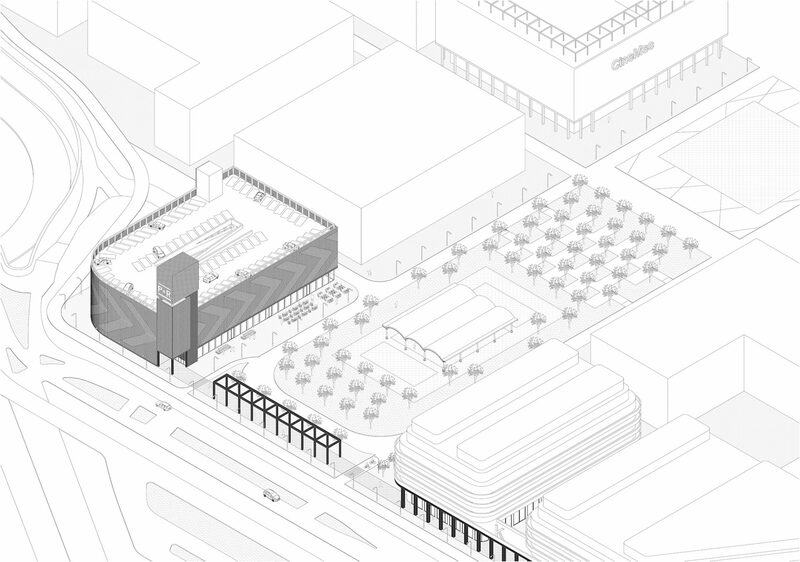 We propose an understated icon that interprets the classic principles of the masterplan in a contemporary way in order to shape the civic space of the new centre. 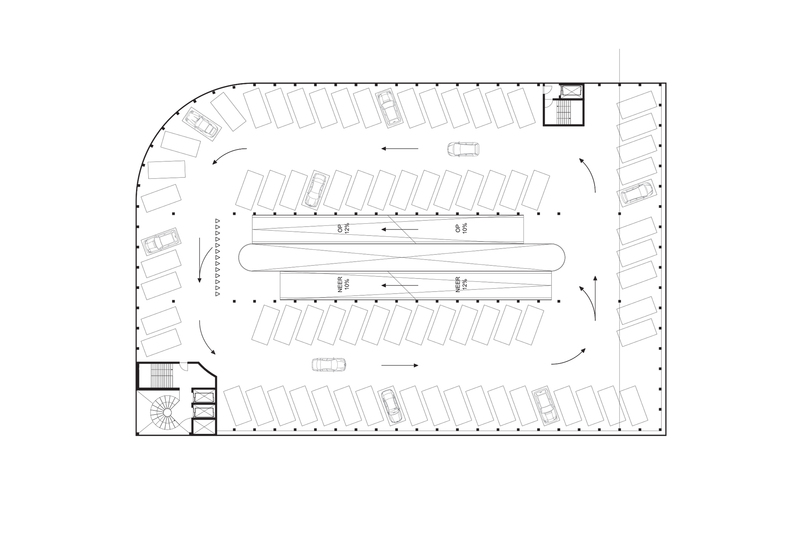 A parking garage, with its function of a traffic machine, doesn’t automatically lend itself for an attractive omni-directional building with strong representational qualities. However, we are not interested in façadism, but to make a precise and pragmatic architecture . To achieve this we opt for a vertical division characteristic to all blocks of LRC, stone materials and refinement in detail, and the articulation of characteristic elements such as entrances and vertical circulation. 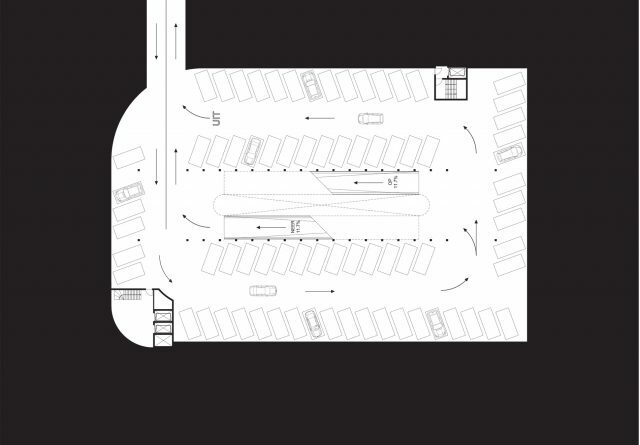 The hyper efficient parking solution consists of a system with two central ramps surrounded by a one-way driving lane, along which the parking places are arranged in a double row along the long sides and a single row on the short sides. The parking places arranged in a 70 degrees angle together with the one way traffic guarantee a comfortable and safe driving experience. In between the two ramps, a void running along all floors brings natural light deep into the building. The volume is divided vertically in the classical tripartite way. An arched colonnade in concrete marks the commercial spaces on the ground level along the Berlin square and Talinn Street. 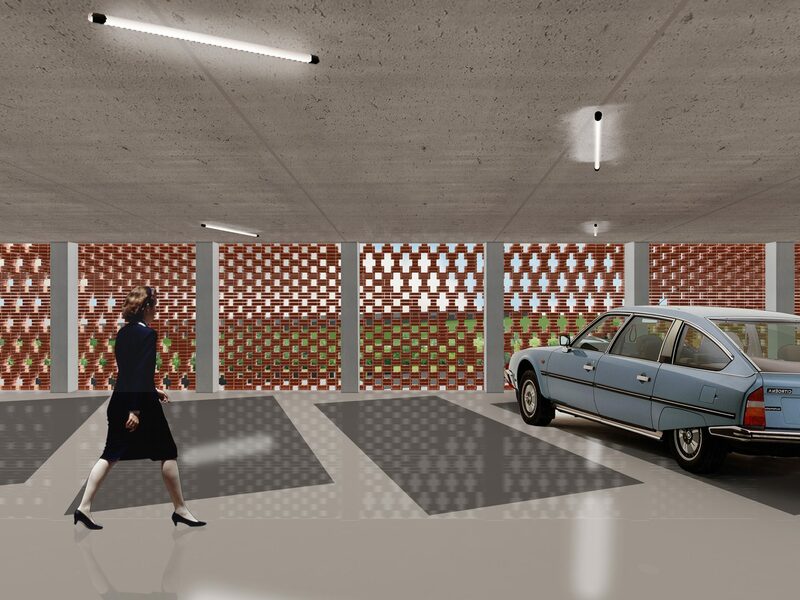 A set-back pergola, continuation of the structure grid, crowns the volume at the roof level, anticipating the future extension with two parking floors. 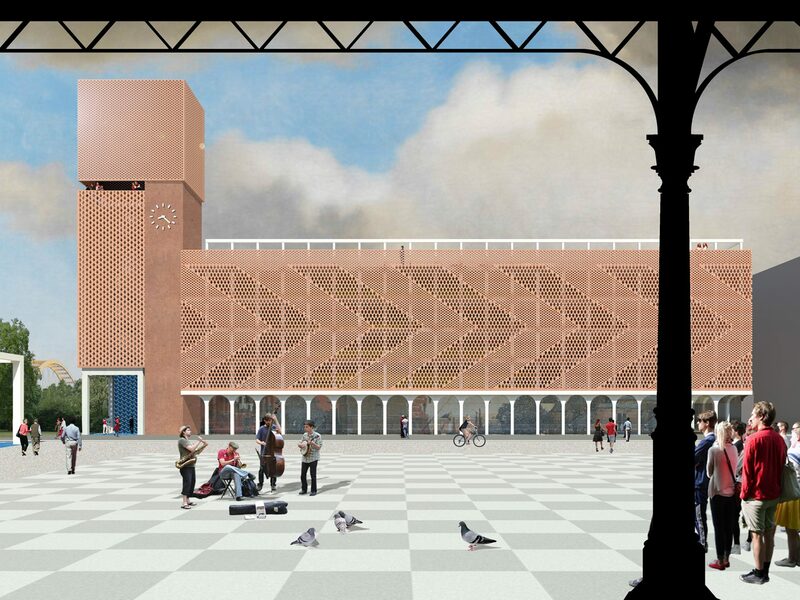 In between, perforated screens of exposed brick wrap the building on all sides, giving it an omni-directional character. The traditional bricks create a skin sufficiently open to ventilate naturally but with enough mass for a strong architectural and urban presence, relating it to the other buildings around. 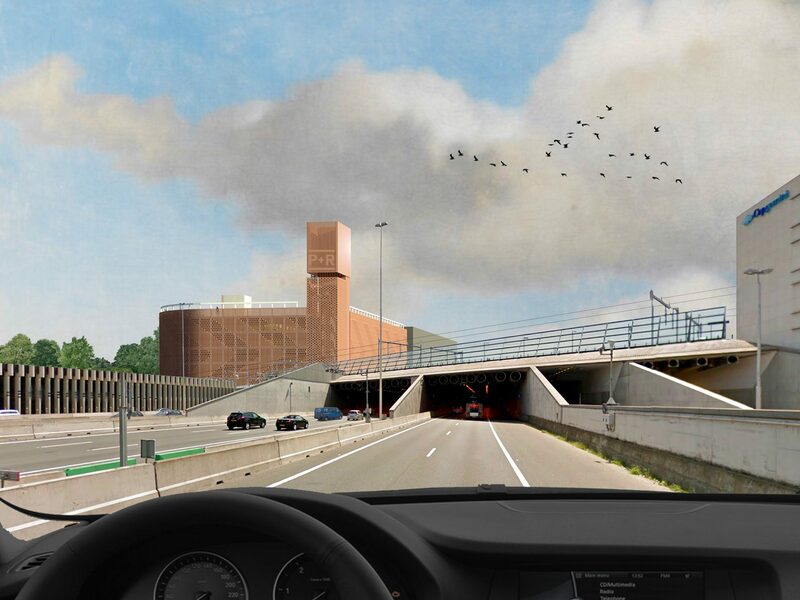 The bricks are laid in Flemish bond with two types of perforations, composing a pattern of arrows which runs around the building and indicates the driving direction of the cars. 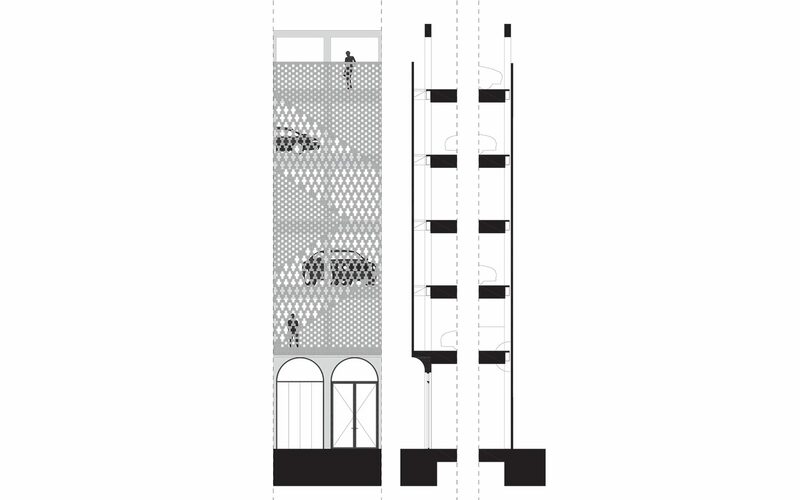 The building-high graphic gives rhythm to the facade, while the perforations give it plasticity. 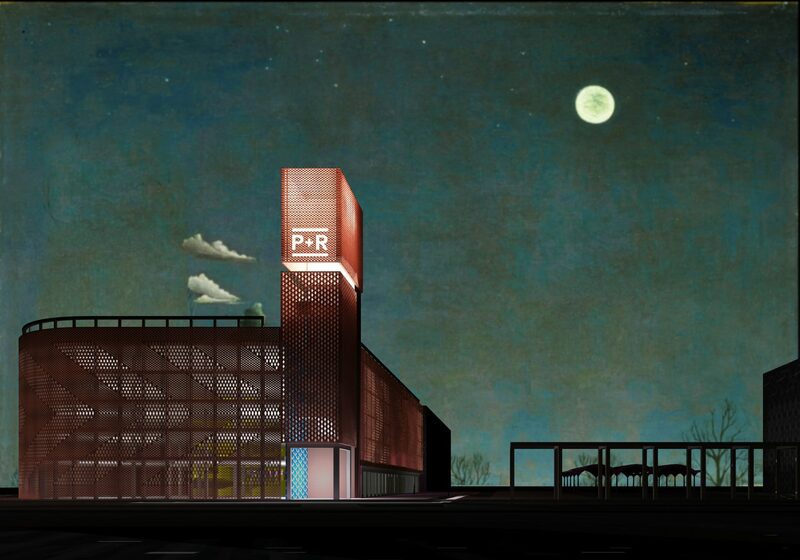 At night, the intriguing image of a luminous brick mass with arrow symbols is reinforced, communicating in a subtle way the function of the building to the outside. The vertical circulation is bundled in two corner towers whose height is already adapted for the future extension. The tower on the corner of the Berlin square and Paris Boulevard is inspired by the one at Berlage’s Stock Exchange in Amsterdam, forming an unmistakable city symbol. 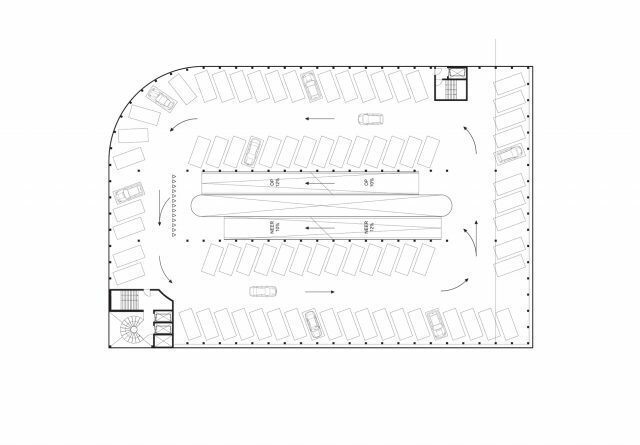 It formalizes the end of the monumental colonnade of Paris Boulevard with a portal which marks the main entrance. 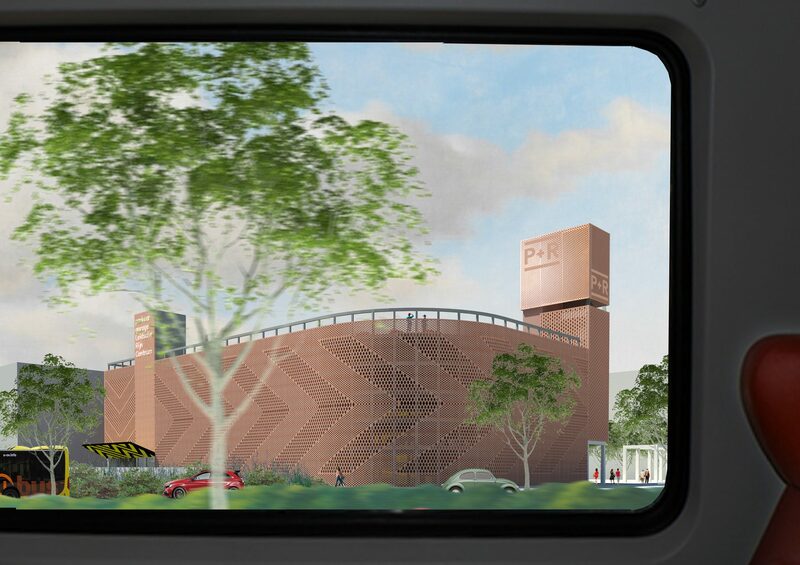 The tower is topped by a floating expanded metal volume in the same colour tone as the masonry, which serves as a universal billboard and makes the tower prominently visible from the A2 motorway and the train station. Underneath the billboard, a cut in the volume allows for a viewing platform offering a panoramic view of the new city and the surrounding landscape . The analogue clock on the Berlin square side is an intentional anachronism, meant to reinforce, not despite but exactly because of its function (of shared infrastructure), the civic character of the building.